The Rock Islands in the Republic of Palau harbor a rich lowland rainforest biota full of endemic and indigenous species of land snails, birds, plants, insects, snakes and lizards. An assistant professor at the SUNY College of Environmental Science and Forestry (ESF) has contributed to the Republic of Palau's fifth National Report to the Convention on Biological Diversity (CBD), an international treaty that focuses on conserving biological diversity. Dr. Rebecca J. Rundell, an evolutionary and conservation biologist with ESF's Roosevelt Wild Life Station and Department of Environmental and Forest Biology, said her work highlights Palau's extraordinary terrestrial biodiversity, which includes a vast and severely understudied snail fauna that is dependent on indigenous lowland rainforests. "My contribution to the report describes what species of endemic snails exist there and the major threats to Palau's indigenous lowland rainforest," she said. "I've made specific recommendations regarding the regions that Palau most needs to protect. All of these areas also harbor endemic and indigenous birds, insects, plants, snakes and lizards." Rundell's contribution to the report was based on her 10 years of fieldwork in Palau, a chain of 586 islands in the western Pacific Ocean. The nation is situated within an oceanic region known as Micronesia, near the Philippines and New Guinea. The CBD, introduced by the United Nations, has three main goals. Its signatories have agreed to develop national strategies for the conservation of biological diversity, pursue sustainable use of the components of that biodiversity, and pursue fair and equitable sharing of benefits arising from genetic resources. The CBD is the key international document governing sustainable development. Rundell's contribution to Palau's National Report supports the goals and targets for the United Nations' Decade on Biodiversity and Aichi Targets, a set of 20 goals established by the nations that participate in the CBD. "Aichi" comes from the name of the prefecture in Japan where the CBD strategic plan was adopted in 2010. The purpose of the Aichi Targets is to inspire broad-based action in support of biodiversity during this decade (2011-2020) by all countries and stakeholders. Rundell describes Palau as an "evolutionary treasure." "We're talking about a place that is starting to show us some of the most remarkable examples of evolutionary diversification on Earth - equivalent to the Hawaiian Islands or the Galápagos," she said. Rundell's recent work with the International Union for Conservation of Nature for the Oceania region indicates at least 90 percent of Palau's land snails are endemic to Palau and that at least half of these species are critically endangered. This was the first such broad-scale, internationally recognized assessment effort for land snails in Oceania. Globally, Rundell said, only 2 percent of all mollusc species have had their conservation status rigorously assessed, indicating major gaps in both basic taxonomic knowledge and conservation attention. Rundell has also contributed a summary to Palau's National Biodiversity Strategies and Action Plans, which is the principal document for implementing the CBD. 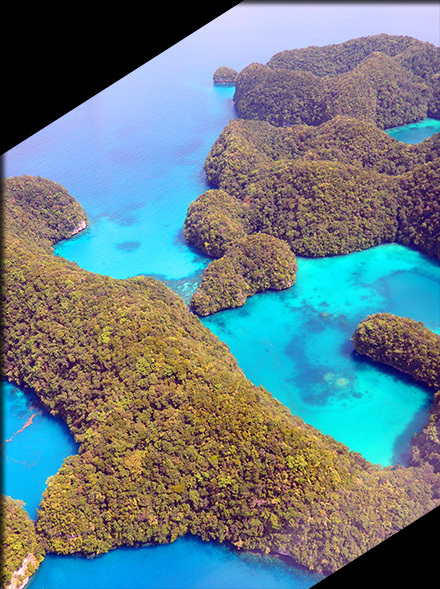 Palau faces several conservation threats, including recent limestone quarrying activities, urbanization, sea level rise, introduction of invasive species and increasing land-based tourism. "These species are important for the health of the forest and Palau's watersheds," she said. "Essentially, without the forest, people can't live on such isolated islands, and neither can the snails. The land snails are indicators that can tell us whether the forest is healthy or not. This can help us make decisions about forest management and conservation that are ultimately vital to the long term survival of Palau's citizens and the incredibly rich biota that surrounds them."